CREATE A VANPOOL. WE’LL GIVE YOU A VAN OR SUV. IT’S THAT EASY. 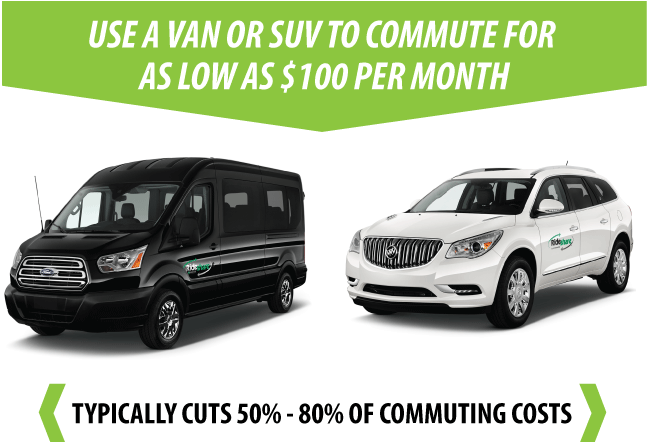 If you have 4+ people who share a similar commute and schedule, you can create a vanpool. Go! Vermont and their partner Enterprise Rideshare, provides a newer model van or SUV. Each rider pays a low monthly fee, which covers costs like gas, insurance, repairs—everything! No loan or down payment is needed. You and/or your co-worker drives and keeps it at their home. SOV: Single Occupancy Vehicle. RTM: Round Trip Miles. Data from vRide and AAA, 2014, rounded up to next dollar. Cut Commuting Costs In Half: Simple and dramatic (50%-80% or more) out-of-pocket cost savings on their commute, which can add up to thousands each year! You can even decrease your auto insurance payments by 10-30% with recreation only or pay-as-you-drive policies. Add Life to Your Car: Vanpooling takes hard commuting miles off your personal vehicle and saves on wear and tear expenses. Never Get Stuck: Our Guaranteed Ride Home benefit ensures that you can get an emergency ride home if you don’t take your personal vehicle to work. Less Stress: Vanpooling takes the stress out of commuting. Plus, it adds time back into your day, to rest, socialize, network or even tackle your to-do-list. Better Commute = Happier Employees: Increased job satisfaction, productivity and morale by reducing the stress and costs associated with commuting. Less Cars. More Parking: Reduced traffic and demand for parking means reduced real estate dedicated to parking and the costs associated with that maintenance. Win, win. On Time and Inspired Employees: Not only is it a recruiting and retention benefit, vanpooling can help get your current employees to work dependably, and on time. Make a Statement: Knowing that your business or organization is contributing to a better quality of life and cleaner environment just feels good. Low Investment. Big Rewards: Free services like vanpooling and our Guaranteed Ride Home are easy to set up and quickly pay off. Plus, there are decreased FICA taxes for your company (and a pre-tax benefit for employees). On-Site Seminars: We provide presentations to employees on the benefits, logistics and practicality of alternative transportation options. A Guaranteed Ride Home: This free service ensures that employees can get an emergency ride home. Just call a cab or rent a car and Go! Vermont will reimburse them. Certification Benefits: Employers that support ride share programs as a means of reducing their carbon footprint receive added points towards Leadership in Environmental and Energy Design (LEED) certification. Promotional Resources: Helpful tips on how to get started and other free resources are available to promote your program internally, such as posters, brochures and email templates. Online Access: Click on ‘Start Vanpooling’ at EnterpriseRideshare.com to create an account and check for Vanpools in your area. Where Does The Van or SUV Come From Exactly? The van is provided by Enterprise Rideshare, Go! Vermont’s vanpool partner. Do We Have To Buy A Vehicle? No. You are not responsible for buying or providing a vehicle. So Let Me Get This Straight. One fee covers all the vehicle costs? Yes. Enterprise Rideshare provides a van or SUV, optional gas card, and handles all insurance, maintenance, and roadside assistance. Go! Vermont chips in to subsidize the cost, making it even more affordable. Each rider simply pays their share each month. What If There Is An Emergency And Someone Needs To Get Home Before The Rest Of The Vanpool? With the Guaranteed Ride Home benefit, you can take a cab, bus or other transport home should an urgent need arise, and Go! Vermont will cover travel costs up to $70. Once you have a group of people interested, give us a call at 800-685-RIDE, and we’ll get you started!